Today we have a guest blogger: Karen Apple. I first met Karen at CPC (Children’s Pastor Conference.) Her joy which overflows from her heart and her passion for encouraging churches to make early childhood ministry a priority draw people to her. Parents enter the church building where a greeter points them to the area they’ve requested. Their hearts race as they see a counter outfitted with information booklets, pagers, name badges, bag tags and a creatively decorated sign-in sheet. The father’s nerves calm a little when he sees a woman greeting parents. “She seems to know what she’s doing,” he thinks. The mother calms slightly when the woman’s smiling eyes meet hers. The apron clad woman looks into the eyes of the little crawler, “What a beautiful little sweetie you are. I know you’re ready to be rocked and played with and taught all about how much God loves you.” She answers all the parents’ questions, tells them about procedures and activities then claps her hands together and stretches her arms wide to receive the little learner. They stand watching just long enough to see their daughter carried to a rocker as music fills the air. This is their first impression of the church. They feel welcome, cared for and assured that they will be called if there is any question AT ALL about their daughter’s needs. “That was really organized. They even tagged the diaper bag”, the dad whispers as the “big church” music begins. “I really like that sweet lady. She seemed to know exactly what I was thinking,” says the mom. Fifteen minutes later, the uneasy mother slips out of the back row and tip toes into the nursery hallway. There she hears a lady singing, “God made your fingers. God made your toes. God made your tummy, tickle, tickle and God made your nose.” Her daughter’s laughter brightens her heart and calms her fears. She decides they will definitely come back again. The heart of a child and even her parents are unlocked with love. Smiling eyes, information and affirming tones speak love to the parents. Open arms, smiling faces, gentle voices and a bottle when she needs it demonstrates love to the “littlest learner”. Visitors, who have this kind of positive experience in the nursery department, assume the church values what they value and they are ready to learn more. Karen is a licensed children’s minister who speaks, writes and mentors leaders who invest in the lives of children. She adores apples, especially her husband, Steve. This easy and quick activity helps family members express gratitude in a practical way. Just put out a jar (kids can decorate it! ), pieces of fall colored paper and a pen. During the week before Thanksgiving, have family members write things they are thankful for as they think of them. 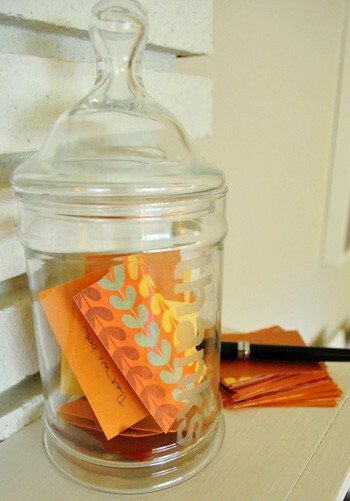 On Thanksgiving day, open the jar and read all the expressions of gratitude. Keep the slips of paper-maybe even make a scrapbook- to remember throughout the year.